Rohingya children carrying firewood into the Kutupalong camp in Bangladesh. Refugees have stripped almost all the area vegetation to use in cooking fires. Rohingya children dig up tree roots to use as firewood. 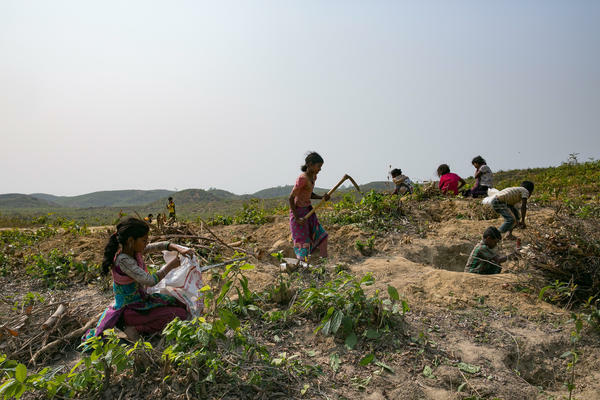 Deforestation in the refugee camps in Bangladesh has increased the risks of flooding and landslides. Like millions of global citizens, Abraham Leno has been riveted by the story of the 12 boys and their soccer coach trapped in a cave in Thailand. "I sat around the radio with my family and we wanted to hear the recent updates of the kids, every little detail," he says. "To see all the governments sending their best divers, giving them equipment, offering their moral support — it was a beautiful thing to see." But Leno has another perspective. As a youth, he spent ten years in refugee camps in Guinea. Now working at the American Refugee Committee, he wishes that the media had paid more attention to his plight and his fellow refugees: "It would have shed a better light to create the understanding necessary to help us." Others share his concerns. Manyang Reath Kher became a Lost Boy at age 3 and later founded the charity Humanity Helping Sudan. He says, "I don't want to sound horrible to those kids [in the cave], but the attention they got, it should be spread around. Give that to other children, too." The aid community is grappling with that issue as well. While they all stress that they were deeply moved by the story of the boys in Thailand, they raise a point: Can the world bring the same level of care and resources to other children living in crisis? 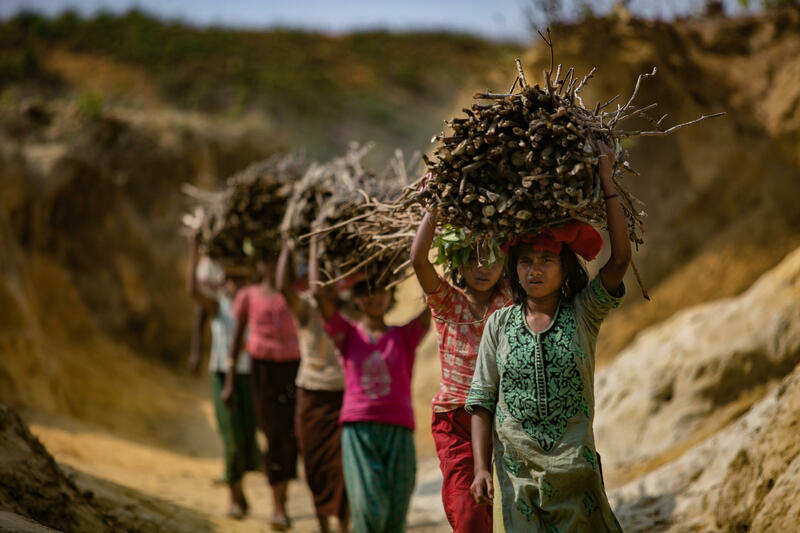 More than half a million Rohingya children live in camps in Bangladesh, for example, and 800 children die of malaria each day. There are, of course, reasons why the cave story is so riveting. "This is a human story. There's a clear drama," says Brian Klaas, a fellow of comparative politics at the London School of Economics. "Everybody is rooting for them." He'd like to see stories about Rohingya refugees, Syrian refugees and South Sudanese refugees told "in a straightforward way." But there isn't always an audience for such stories. "Protracted conflicts are more and more difficult to get people energized about," says Christy Delafield, communications director at Mercy Corps, an international aid organization. "It loses newness and novelty." There's another reason why a story about 12 boys gets more attention than the world's 12 million refugees under the age of 18. The more people who are suffering in a crisis, the harder it is for people to become engaged with their stories, says Delafield. That's because of a phenomenon known as "psychic numbing," which psychologist Paul Slovic has written about extensively. "In a rational world, we should care twice as much about a tragedy affecting 100 people as about one affecting 50. We ought to care 80,000 times as much when a tragedy involves 4 million lives rather than 50. But Slovic has proved in experiments that this is not how the mind works. "When a tragedy claims many lives, we often care less than if a tragedy claims only a few lives. When there are many victims, we find it easier to look the other way." The cave crisis was also notable for the response by the world's rich and famous. Tesla CEO Elon Musk put together a team to design and build a special "kid-size" submarine to assist in the rescue efforts (although the Thai government said it was "not practical for this mission"). What if the same degree of brainpower and resources were devoted to other crises, asks Klaas. "A lot of [other] tragedies are much more solvable. If we had Elon Musk devote his attention to malnourishment or people dying from preventable disease, then things would get solved much quicker. We'd be able to save much more than 12 people in two weeks." And even though big numbers can be overwhelming, they can still be powerful, says Martin Scott, a senior lecturer in media and international development at the University of East Anglia. "The point is that it doesn't have to be human interest stories to tell about the suffering of others," says Scott. "I was reading a U.N. briefing and it made me cry. The statistics were so overwhelming. I didn't need the story of a child who's just lost her mother to make that meaningful."